The Healthiest Jelly Doughnuts (Fat Free/Sugar Free/Whole Wheat) - No Way That's Healthy! I am super excited to share this recipe with you. The Jewish holiday of Chanukah starts this week! 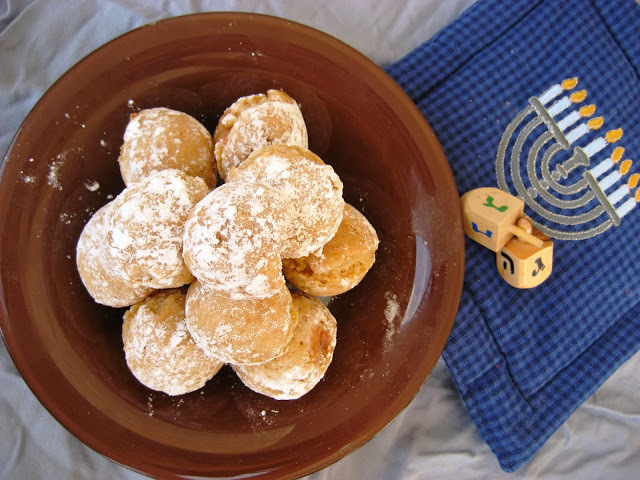 Most of the Jewish holidays are surrounded with food and Chanukah recipes are specifically high in fat. Indulging in one jelly doughnut is fine, but that is if you can only stick to having just one. And even so, only one deep fried doughnut will most probably leave you feeling sick. 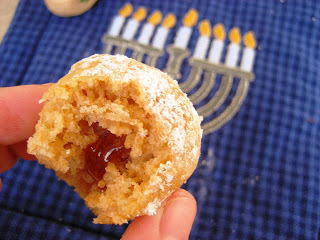 Oh, and there are 8 days of Chanukah- I highly doubt you can go all 8 days and only have ONE doughnut! At least, I can’t. Obviously, I have been working on a healthy version and I cannot believe how good they came out. The only thing missing is the heavy fried in oil taste. And personally I don’t miss that at all. These are soft and light and still have that perfect jelly filling and powdered sugar coating. The powdered sugar is optional, as that will be adding sugar to this recipe, but it really is so little that I am fine having them with it. You can make these any size you’d like, but I used a doughnut hole pan. It looks like this. They are the perfect size and you can have more than one without any guilt. And so I present, drum roll please…….The Healthiest Jelly Doughnut recipe out there! Preheat oven to 350F. Spray doughnut hole pan with oil. In a mixing bowl combine the flour, baking powder and salt. Add in the yogurt, honey, vanilla, and the beaten egg. Stir till there is no more dry flour. Do not over mix. Use a tablespoon to pour the mixture into the pan. Bake 8-12 minutes or when top is firm. Be sure you do not over bake. Tops should not be dark. Let cool and carefully remove from pan. I used a spoon to help scoop them out. To Fill: In a cup mix 1/4-1/2 cup of strawberry jam so it is smoother. Use a piping bag or a (clean) medicine syringe to fill them. Place some powdered sugar in a bag. Spray the doughnuts with some oil spray (optional) and place them in the bag one or two at a time. Shake till coated in the sugar. My batch made 17 mini jelly doughnuts. *Though these are not the real-deal fried jelly doughnuts they are delicious AND they happen to actually come out great fried also. If you do fry these, watch as they can burn quickly and keep them mini so the center cooks evenly. 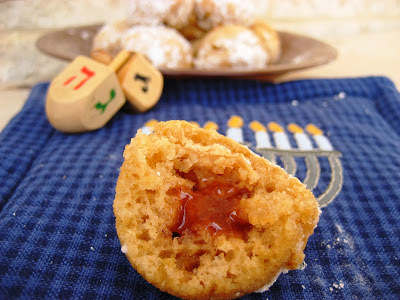 I have more healthy Chanukah recipes to share with you so please come back! what do you recommend for those who don't have that donut pan? Thanks! 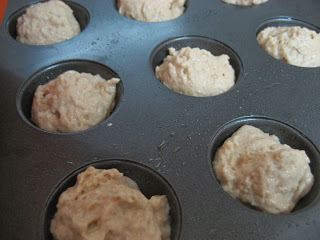 You can use a muffin pan sprayed well without a liner, like the silicon ones. Or you can try with a liner but i do not know the results. I think it should be fine, but they will make less and will be larger doughnuts. If you try, let me know how they come out! If I don't have whole wheat flour, can I substitute white flour? Thanks!! How do you recommend baking them if one does not have a donut pan. I haven't tried it but be sure you spray the muffin pan well and don't fill it up all the way, you still want them to be flatter to look more like doughnuts and not muffins. It can probably bake 10 minutes. Be sure you do it just enough so they don't over bake. These are also best fresh. Can I substitute something nondairy for the yogurt? Any suggestions? Thanks! These look great. I haven't tried, but they make soy or coconut yogurt's that may be a good replacement. You may be able to use a non dairy milk as well, but again I didn't try so I can't vouch for the results. Let me know if you do have success! Thanks! Wow! Thanks for posting! My hubby is begging me to make donuts and being that I never have I was nervous I'd have to test-taste them time and time again….racking up the calories and junk :(. This is great alternative! Wonder how it'll go over with the man…only time will tell. Also if anyone wants to do powdered sugar but doesn't want the sugar…. wallah! She does it again! I can't have dairy or soy….any other ideas for replacements? I am glad to help 🙂 That powdered sugar is a great idea, I would suggest trying erythritol though. I have used xylitol and personally I get bad stomach pains. But It is only a little amount so I am sure it would be fine. As for a replacement, I think they also made almond or coconut yogurts somewhere, but you may be able to try almond milk? But really I do not know, so sorry! Did you ever try "So Delicious" cultured coconut milk which is dairy and soy free and has a heart-K hechsher from Kehilla Kosher (Igud Hakashrus of Los Angeles)? I have used it to make Indian chicken dishes that require yogurt. No I haven't, but i've seen it around. I'll give it a try, thanks! These were really good! I filled them with caramel sufganiyah filling – the only problem was that the doughnut soaked up all the filling. Maybe when you fill it with jelly it stays better? Thanks for the recipe, I will definitely be making them again next year! My father and I are type2 diabetic and I was looking for a recipe for sugar free jelly donuts. I can't wait to make these. They look so good. Thank you! Can I use Greek yogurt? I think it should work, maybe use a bit less than one cup. Can you use splenda powder instead of liquid stevia? Never tried, but maybe using a little will work? Thanks, I am maklng them now with plain flour and no added sugar substitute.